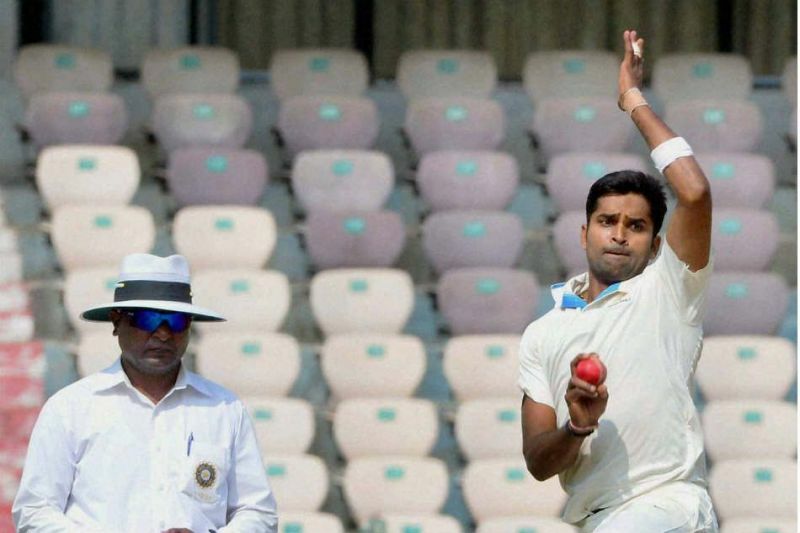 Nagpur, Dec 7: Vinay Kumar's 6/34, including a hat-trick, helped Karnataka to bundle out Mumbai for 173 and their batsmen then scored 115/1, trailing by 58 runs, on the opening day of the Ranji Trophy quarter-final here on Thursday. In the morning, the Karnataka paceman was right on the money. He dismissed in-form opener Prithvi Shaw off the last ball of the first over and then again in the first ball of the third over he dismissed Jay Bista. Vinay completed his hat-trick by taking Akash Parkar, who was promoted to the top of the order. After that, the Karnataka bowlers went on with the same and created havoc in the Mumbai's batting line-up to bowl them out for a low total. In reply, Karnataka batsmen, R. Samarth (40) and Mayank Agarwal (62) started off on a good note before Samarth was dismissed by S. Dubey. Incoming batsmen M. Kaunain Abbas (12) then joined Agarwal and made sure they wont loose any more wickets till the end of the day's play. In other match at Jaipur, Abhimanyu Easwaran's (129) ton helped Bengal to finish the opening day at 261/6 against Gujarat at the Sawai Mansingh Stadium. Easwaran gorged 175-run partnership with Anustup Majumdar (94) and rescued Bengal from 59 for 4 after they were put in to bat. In the third match at Vijayawada, Madhya Pradesh scored 223/6 against Delhi with A.S. Dane (59) and Naman Ojha (49) scoring handsomely to the cause. Apart from them, Harpreet Singh (47) also contributed at the lower order. For Delhi, Vikas Mishra sclaped three wickets for 40 runs. In the last match at Surat, which was kicked off only after tea due to wet outfield, Vidarbha were struggling on 45/3 at stumps on the opening day. Medium pacer M.D. Nidheesh took one wicket while left-arm spinner K.C. Akshay chipped in two wickets.